Rock carvings at 2nd location. The curvy ladder looking things are ships. The small red dots are cup marks and the oblong red blob just left of center on lower end is a foot mark. Information from sign – “Archaeologist excavations have shown that Madsebakke has been a popular destination for thousands of years. When the carvings were made, it was already a sacred rock. The story began in the late Stone Age, about 3500 BC, when a couple of posts were erected in a large depression on the rock. Later, the depression was filled up with stones, pottery and burnt wattle-and-daub. Just after 1000 BC during the Bronze Age, a fence was erected in front of the rock. The fireplaces and animal bones found reveal that ritual meals were eaten here. During the Iron Age, there was a grave site here with simple cremation graves, and in about the year 400, a house stood on the rock. 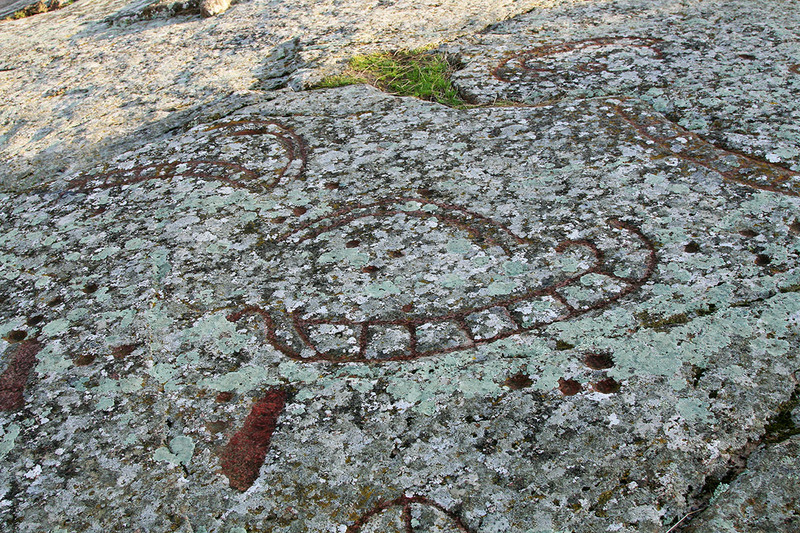 The ship carvings on Madsebakke hill were carved over many years. They may mark special occasions. Perhaps good luck before a long journey, a rite of passage or a wedding?